Many people have already ascribed a certain relevance to the 11th day of November this year. Some suggest that there is a nearly mystical alignment, as the date of 11/11/11 carries special significance in the universe. Because of it, many weddings are already planned for that day, as are parties and various events. But while some may be out tying the knot or celebrating with friends, several million others will likely be glued to their monitors and TVs, experiencing the potential awesomeness that is the next Elder Scrolls title. Rather than being a sequel to Elder Scrolls: Oblivion, Skyrim is another story in set in the same world. 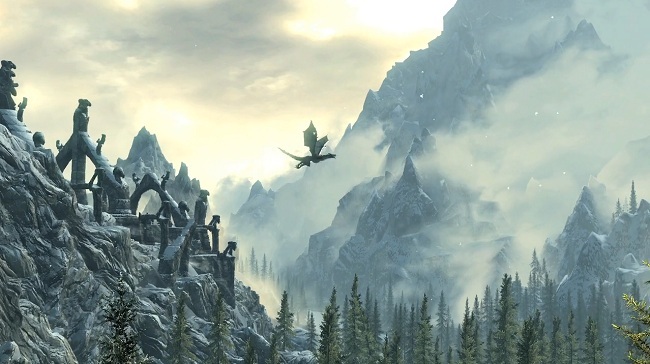 Taking place more than two centuries after the events of Oblivion, a civil war has broken out in Skyrim, with half the people wishing to secede from the crumbling Empire, and the other half wishing to remain. Once again you start the game as a prisoner, but it soon becomes clear that you have a part to play in a series of prophetic visions that will lead to the destruction, or salvation of the world. As the last Dovahkiin (Dragonborn) anointed by the Gods, you must stand and defeat the giant dragon Alduin, before it consumes everything. In the trailer below, Bethesda has given us just a taste of what to expect. Powered by the new Creation Engine, the clip shows a mix of in-game cut scenes as well as some actual gameplay. Expect to hear a whole lot more about this game before it arrives for PC, PS3 and Xbox 360 on November 11.